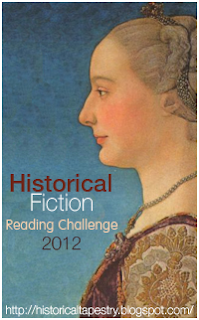 The Historical Fiction Reading Challenge 2012 was hosted over at the Historical Tapestry blog again this year. I decided to choose 'Struggling the addiction' and challenge myself to read 10 historical fiction books in 2012. Sounds fun! Can't wait to read your reviews. Enjoy! Youre so right. Im there with you. Your blog is unquestionably worth a read if anyone comes throughout it. Im lucky I did because now Ive obtained a whole new view of this. I didnt realise that this issue was so important and so universal. You undoubtedly put it in perspective for me. If I had the time I'd certainly use it as an excuse to reread The Book Thief (Mark Zusak) and A Town Like Alice (Neville Shute). Have fun! Thanks TBM, will do. I enjoyed The Book Thief too Selwyn, but haven't read A Town Like Alice, remember watching the TV mini series though. Howdy! I could have sworn I’ve visited this site before but after looking at a few of the articles I realized it’s new to me. Anyhow, I’m definitely happy I came across it and I’ll be bookmarking it and checking back frequently!